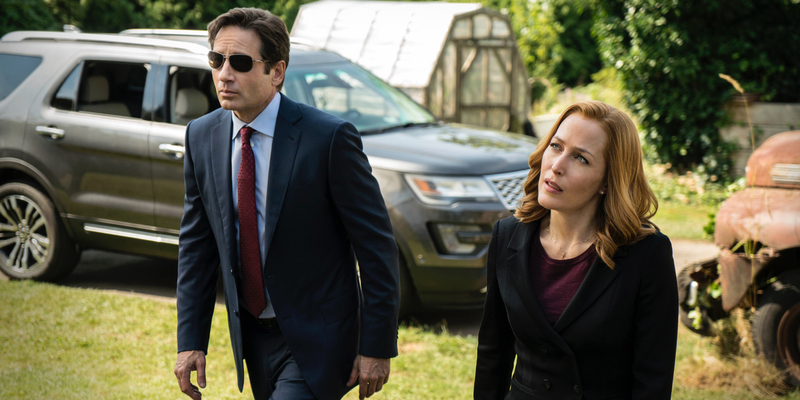 Google references, smartphones, non-verbal Ford product placement – the second episode of The X-Files revival has it all. While overt product placement is kind of its own thing, the first two are more directly indicative of the time that has passed since the show was last on the air. Their inclusion here, especially accompanied by dialogue in which Mulder and Scully describe themselves as "old school," works to not only modernize the series in incremental fashion, but also to afford the show an opportunity to acknowledge an awareness of the unique situation it is in – i.e., of being a revival of a series in whose heyday landlines were largely the norm, and the Internet was, for the average user, just a tool with great potential. All that is to say, 'Founder's Mutation' is tasked with handling many of the same concerns as last night's premiere, but it goes about addressing those issues in a far more familiar and pleasingly modest fashion. Gone are the lengthy monologues and diatribes about conspiracies within conspiracies and declarations of grand truth-finding undertakings. In their place is an episode that, though still rickety at times, is more streamlined and sophisticated in its delivery of what would now be considered classic X-Files tropes. Written and directed by James Wong, 'Founder's Mutation' is the first revival episode to take on the monster-of-the-week format, shifting the dense mythology building of 'My Struggle' so far into the background it's hardly even in the picture. The benefit of this is an hour that feels more organic, like an actual continuation of the previous nine seasons rather the shuddering, sputtering jumpstart of the first hour. Even Duchovny and Anderson seem more at ease in their characters, sharing the sort of bond that only Mulder and Scully could have. But this time, the famous sexual tension between the two is replaced with intense familiarity and an unspoken intimacy that becomes explicit as soon as they start talking about William, the son they had together and gave up for adoption. The mention of William and the two sequences in which Scully and Mulder's parental hopes and fears are explored in dreamlike fashion is the best example of how Wong manages to weave the show's expansive history into the narrative of what is ostensibly a single-serving episode about parenthood and the sacrifices that are made in order to do what is best for a child. Of course, this being an episode of The X-Files that revisits the fact Mulder and Scully gave their child up for adoption in order to protect him, the story has to match such an intense action with one of equal or greater intensity. This leads to an investigation of Dr. Augustus Goldman (Doug Savant) and the government sanctioned experiments he did on his own children (Molly and Kyle) that gave them extraordinary abilities. There's just a hint of alien conspiracy in Dr. Goldman's studies, and given what Scully found out about her DNA in the premiere, it's no surprise that she's the one to broach the subject – a fact that does not go unnoticed by the show, in the form of Dr. Goldman informing Scully he'd been told she was the rational one. The timing of the story is no coincidence either, and also points to the level of awareness that seems to permeate every second of the hour. The fact that Mulder and Scully went well past the "just kiss already" stage of every good television pairing of very attractive people makes it as necessary a thing to touch on as it is potentially emotionally satisfying. But Wong wisely doesn't linger too long or become too entangled in the particulars. He simply addresses Mulder and Scully's complicated history with a cursory examination of what came from it. The result is an examination of their closeness that reduces the standard skeptic/believer conflict in favor of something more intimate. While the premiere was stuck serving fans with dialogue like "The truth is out there" and "You want to believe," 'Founder's Mutation' goes about its fan service in a slightly less overt manner. Scully and Mulder bounce ideas off one another about the death of Dr. Sanjay (Christopher Logan) without resorting to Scully taking her typical unconvinced stance, while Mulder hits a bulls eye with his hunch. Sure, there's a little bit of the series' magic missing in the ease with which the two communicate, but that distinction is a sign of progression; it would be disingenuous if the revival were to take the key relationship dynamic back to square one (or even square two). Besides, 'Founder's Mutation' already has plenty going for it to make it feel like a classic episode of The X-Files. The opening sequence alone, starting with that close-up of Sanjay's blood-red eye and his eventual meltdown and suicide, as a result of the high-pitched noise being pumped telepathically into his brain by Kyle (Jonathan Whitesell) was, for lack of a better term, about as X-Files-y as things get. And, despite some thin characters and motivations, the hour managed to maintain the essence of what made the series so much fun to begin with and remind fans why it's okay to be excited about the show's return. Two episodes in, The X-Files is still getting its sea legs, but by the end of the second hour the series can at least move around with a modicum of confidence. This wasn't necessarily a great hour of television, but it at least worked to incorporate more of what fans were expecting, and perhaps some things they were not. The level of self-awareness came as a bit of a surprise, but it proved to be a welcome one at that. No show can come back after so many years and not address the peculiarity of its situation. Thankfully, The X-Files managed to do so in a way that felt in keeping with the show itself. The X-Files returns next Monday with 'Mulder & Scully Meet the Were-Monster' @8pm on FOX.